Houston is home to many great things, from the people, to the history, to the broad spectrum of things to do and places to see, you're bound to love your stay here in Houston. You can see some talented performers in the Theatre District, tour headquarters of NASA, or visit some of the best nightlife in Texas. There is also some amazing nature in the area and some of the best places to enjoy it. We highly recommend the Armand Bayou Nature Center, the Brazos Bend State Park or the Mercer Arboretum and Botanical Gardens. Be sure to make the most out of your visit in Houston, although it won't be hard. Whatever you decide to do or see in the Houston area, you are going to want to seek out some amazing luxury entertainment transportation. And we not only believe but we know that we offer the best of the best in this regard. H Town Limos is the most experienced and qualified company to transport you around these parts in top notch vehicles. We can provide our services and travel to all types of events and it really doesn't matter how large your group is. And while you are riding in comfort and style, you can enjoy all of the amenities and features we have installed to make your night even better while our drivers adhere to your itinerary. All you have to do is give our courteous booking agents a call to guide you through the process quickly and easily. Are you ready to begin your booking? Do you need more questions answered? We suggest that you begin by reading as much as you can on our website so that you become very knowledgeable about what we do. As you are perusing each page, make sure that you have a notebook with you so you can jot down any questions you might have as they come up. Then, when you are ready, you can give us a call or email at any time, we'd be glad to hear from you. Our agents are very courteous and they will always treat you with the highest level of respect. We promise that you will never be pressured into making any kind of decision. Our favorite limo companies across the country would also like to hear from you if you need service in their area. Check out Pittsburgh Limousine and Ann Arbor Limousine. Also in North Carolina Raleigh Limo has the best service. If you have any other areas that require service we would love to be able to help you out. We understand the looming idea that limousines and limo buses will be too expensive to consider, but we're here to tell you differently. We are constantly striving to make sure our service is a sreasonable as possible. We operate on what is called a graduated scale. This means that when we experience any kind of savings in terms of our pricing elements, we are more than happy to pass those savings along to you. For instance, if fuel prices have plummeted, we feel like it is our duty to adjust our prices so that your quote will be much less than it would have been. This is part of our policy to treat our customers or potential customers like family. Also, when you talk to our friendly customer service representatives, they will be more than happy to discuss ways in which you can save. There's no better company in the area in regards to accurate and fair pricing policies. You won't see prices here because they are dependent upon variables that change daily in order to maximize your savings at any given time. But what you will receive is a bottom line quote from our agents. One thing that you will never experience with us are hidden fees. We don't believe in them and we feel that they are very disrespectful so when we give you a quote, you can count on that being your bottom line number. We look forward to hearing from you soon about your plans and having a discussion about what our special service can do to take your plans to the next level. Contact us as soon as you can because our vehicles get booked quickly. 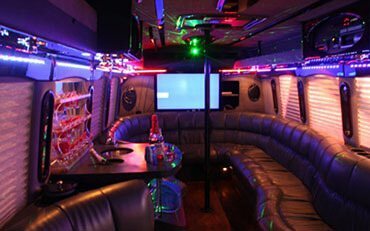 It's bound to be a fun event, but have you ever considered making it even better with a limousine or limo bus? You'll have an amazing time tailgating without worries of designated drivers, traffic, or even walking to the stadium. Chances are, if you're planning your wedding, you know how stressful it can be sometimes. Eliminate some of that stress by letting us take care of your transportation for the night. You won't have to worry with us. Bar hopping, pub crawls, a night out on the town! All of these things are fun events that just got a whole lot better. Drink as much as you want without the worry of how you are going to get home safely. When it comes to limo buses, this one is rocking! There's nothing better than a cool ride throughout Houston, visiting all the best hotspots with your friends. When you think of an F-650, durable handsomeness is probably what comes to mind. Not much is different with this beautiful limo bus! 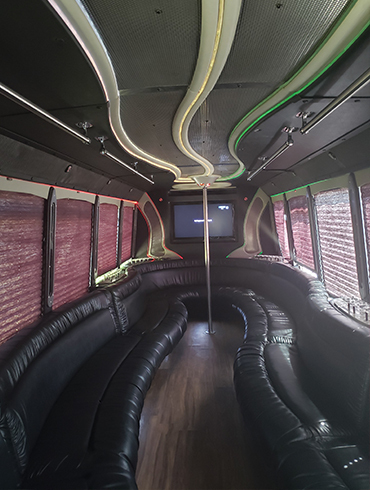 Keep this limo bus is mind for your next birthday party, sporting event, concert, or pub crawl! Avoid the hassle and headache of a DUI when you book with us, as our professional drivers will get you where you need to be when you need to be there. Wow! What a vehicle! 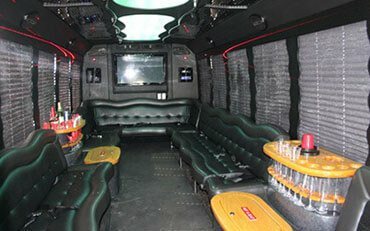 This limo bus is fully updated and renovated throughout the interior and exterior.